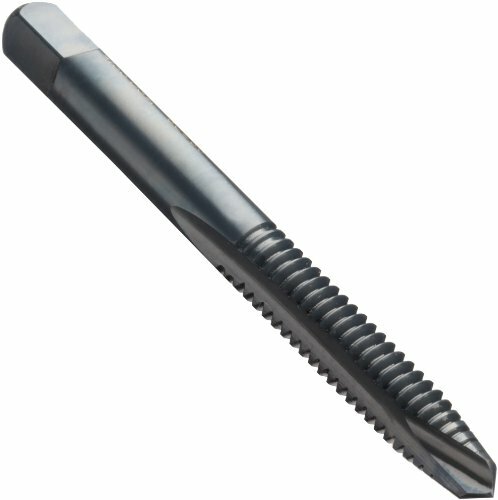 The Union Butterfield 1585A(UNC)/1585A(UNF) high-speed steel spiral point tap has a relieved-style design, straight flutes with a plug chamfer, black oxide finish, and a round shank with a square end, and is used to create right-hand threads in a range of materials. It is available in two different ANSI thread specification standards: UNC (Unified Coarse) and UNF (Unified Fine). The spiral point of this tap (sometimes referred to as a gun tap ) pushes chips ahead of the tool and the straight flutes reduce clogging. Both characteristics make it suitable for threading through holes (extending through the workpiece). The black oxide finish of this tool will not chip. It improves lubricity, resists corrosion, and helps to prevent buildup and welding on the cutting edge of the tool. Relieved-style design reduces the friction between tap and workpiece for longer tool life. A plug chamfer distributes cutting to ease tapping at the beginning of the hole and to maintain correct perpendicular alignment with the workpiece. Right-hand threads are designed to tighten when a head or nut is rotated clockwise (the most common threading direction). High-speed steel (HSS) is a common general-purpose steel for cutting tools, and is compatible with a variety of materials. The round shank with square end helps to minimize rotation in the tool holder. This tool can be used in machines, such as drill presses or lathes, or with hand tools such as tap wrenches. In the Union Butterfield 1585A(UNC) and 1585A(UNF) tap series, taps with 1/4 to 5/16 nominal diameters have two flutes, and those with 3/8 to 3/4 nominal diameters have three flutes. All taps in these series have plug chamfers. This tap conforms to ANSI standards and can create threads to a depth 2 times its diameter. It is suitable for ANSI 2B and 3B tolerance classes: 2B is an average quality fit for commercial and industrial fasteners; 3B produces close-tolerance fasteners used for greater resistance to stripping, as in aerospace applications. 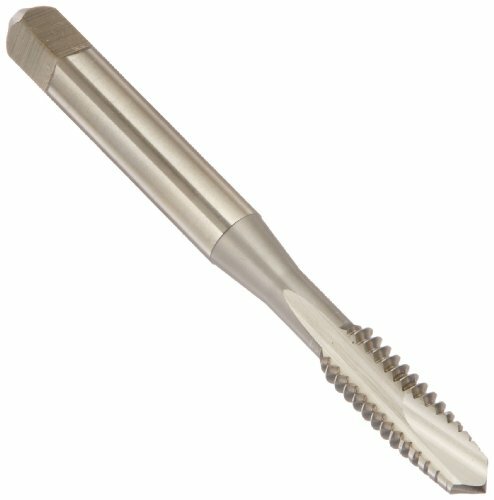 The Union Butterfield TN1585(UNC)/TN1585(UNF) high-speed steel spiral point tap has a relieved-style design, straight flutes with a plug chamfer, titanium nitride (TiN) coating, and a round shank with a square end, and is used to create right-hand threads in a range of materials. It is available in two different ANSI thread specification standards: UNC (Unified Coarse) and UNF (Unified Fine). The spiral point of this tap (sometimes referred to as a gun tap ) pushes chips ahead of the tool and the straight flutes reduce clogging. Both characteristics make it suitable for threading through holes (extending through the workpiece). Titanium nitride (TiN) is a gold-colored ceramic coating that combines hardness with low friction for extended cutting tool life and permits faster cutting speeds than with uncoated tools. Relieved-style tap design reduces the friction between tap and workpiece for reduced tool wear. A plug chamfer distributes cutting to ease tapping at the beginning of the hole and to maintain correct perpendicular alignment with the workpiece. In the Union Butterfield TN1585(UNC) tap series, taps with nominal diameters of and 5/16 are available with two or three flutes and those with diameters of 3/8 to have three flutes. In the TN1585(UNF) series, taps with nominal diameters of and 5/16 have two flutes and those with diameters of 3/8 to have three flutes. All taps in these series have plug chamfers. This tap conforms to ANSI standards and can create threads to a depth 2 times its diameter. TN1585(UNC) taps are suitable for ANSI 2B and 3B tolerance classes: 2B is an average quality fit for commercial and industrial fasteners; 3B produces close-tolerance fasteners used for greater resistance to stripping, as in aerospace applications. TN 1585(UNF) taps are suitable for the ANSI 3B tolerance class. Tapping is one of the most critical operations in any shop. That's why you need high quality RedLine taps, which are proudly made in the USA. To provide superior precision and cutting control when working with a wide variety of materials, our high performance taps as well as general-purpose taps deliver every time. Our offering includes: spiral point taps, spiral flute taps, gun taps, form taps, as well as a variety of other types. 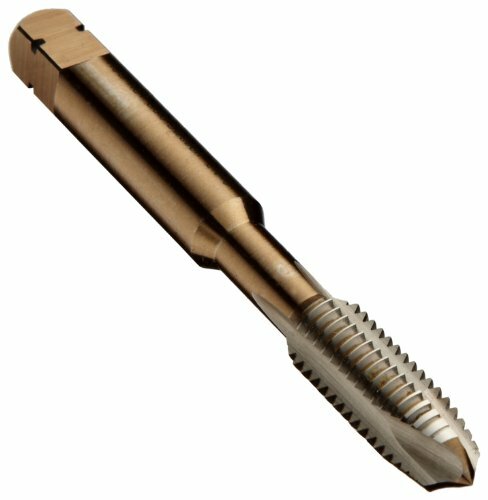 To ensure that we can provide you with a tap that effectively creates the thread you need, we offer tools with multiple coating options including CrC, Oxide, TiCN and TiN. In addition to coatings, our taps are available in both Vanadium cobalt and High-Speed Steel. With these options, we can guarantee that you'll find the exact tool to expertly tap materials of varying hardness, while resisting excess wear and tear, regardless of your specific project. From high volume production to single hole-tapping applications, and from through-holes to blind holes, you'll find the coated or uncoated tool to get the job done. No matter what type of tap you need, you'll find it here at RedLine, simply browse our expansive selection below, or use the filter to find and order your tools even faster. 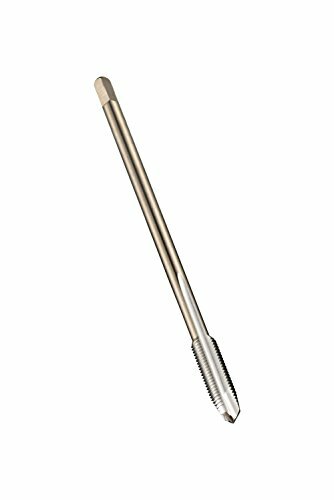 Series 756 High Speed Steel Spiral Point Bottoming Tap, TiN Coated. 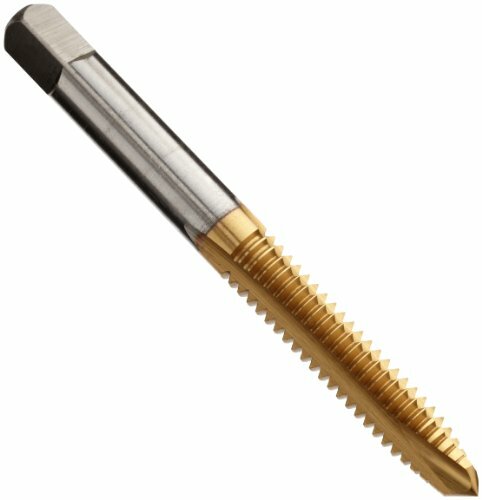 The Dormer MTT-X E005/MTT-X E015 powdered-metal steel spiral point tap has a round shank with a square end, gold oxide finish, and a plug chamfer, and is used to create metric right-hand threads in a range of materials, with best performance in steel, copper, brass, aluminum, magnesium, and thermoplastics. It is available in two different thread specification standards: Metric Coarse (M) or Metric Fine (MF). The spiral point of this tap (sometimes referred to as a gun tap ) pushes chips ahead of the tool and the straight flutes reduce clogging. Both characteristics make it suitable for threading through holes (extending through the workpiece). Gold oxide is a low-temperature heat treatment that reduces grinding stress within the tool. The plug chamfer distributes cutting to ease tapping at the beginning of the hole and to maintain correct perpendicular alignment with the workpiece. In the Dormer MTT-X E005 series, taps with nominal diameters of 4 mm to 12 mm are available with two or three flutes and taps with nominal diameters of 14 mm to 20 mm have three flutes. In the MTT-X E015 series, all taps have three flutes. All taps in both series have plug chamfers. This tap conforms to ANSI standards and can create threads to a depth two-and-a-half times its diameter. It is suitable for the 6H tolerance class: 6H is used for a normal length of thread engagement and medium tolerance quality. Dormer E005M6 Spiral Point Taps, Bright Coating, M6, Metric Coarse, Full Length 2.1/2", Flute Length 0.5075", Shank Diameter 0.2550"
Dormer E005M83FL Spiral Point Taps, M8, Metric Coarse, Full Length 2.23/32"Flute Length 0.5939", Shank Diameter 0.3180"
Spiral Point design pushes chips forward in a through hole. YG-1 N7 series super HSS spiral pointed tap for steel and stainless steels uptp 35HRc. High-speed steel tools are good for most general purpose applications, offering a combination of hardness and toughness for wear resistance. Black oxide treatment adds lubricity and creates small pockets on the surface of the tool that act to hold coolant near the cutting edge. Round shanks allow use with a wide variety of toolholding systems. Straight flute tools allow chips to collect in the flutes as they cut and are well suited for most applications in shallow cuts. Right-hand cut tools have a cutting action that engages when they are run in a clockwise direction. Applications: Good for low carbon/free machining carbon steel, pure aluminum/aluminum alloys, pure and alloyed copper, free machining brass/alloyed brass, zine, magnesium. Excellent for medium to high carbon steel, free machining stainless steel. YG-1 K9 series vanadium alloy HSS spiral pointed tap for multi-purpose. High-speed steel tools are good for most general purpose applications, offering a combination of hardness and toughness for wear resistance. Uncoated tools feature just the base substrate without any additional treatment or coatings and are suitable for a wide range of applications. Round shanks allow use with a wide variety of toolholding systems. Straight flute tools allow chips to collect in the flutes as they cut and are well suited for most applications in shallow cuts. Right-hand cut tools have a cutting action that engages when they are run in a clockwise direction. Applications: Good for steel castings and forgings/heat-treatable alloy steels, free machining stainless steel, heat and corrosion-resistant stainless steel/valve stainless steel, aluminum alloy castings, nodular cast iron/chilled cast iron/meehanite iron/ductile iron, 71/ and 625 inco/waspaloy/hastelloy/invar/monel/incoloy. Excellent for low carbon/free machining carbon steel, medium to high carbon steel. Drill America DWT Series High Speed Steel hand taps are the most versatile taps for hand use, or for tapping under power. Hand taps are popular for use in general machine tapping or CNC tapping. For re-threading and making new threads. High Speed Steel Hand Taps come in three styles: Taper Style: Starts the thread square with the workpiece. Plug Style: Generally used in thru holes. Bottom Style: Generate the thread to the bottom of the hole. A tap set contains 1 taper, 1 plug and 1 bottoming tap. High Speed Steel Hand Taps come in three styles: Taper Style: Starts the thread square with the workpiece. Plug Style: Generally used in thru holes. Bottom Style: Generate the thread to the bottom of the hole. YG-1 L7 series vanadium alloy HSS spiral pointed tap for multi-purpose. High-speed steel tools are good for most general purpose applications, offering a combination of hardness and toughness for wear resistance. Uncoated tools feature just the base substrate without any additional treatment or coatings and are suitable for a wide range of applications. Round shanks allow use with a wide variety of toolholding systems. Straight flute tools allow chips to collect in the flutes as they cut and are well suited for most applications in shallow cuts. Right-hand cut tools have a cutting action that engages when they are run in a clockwise direction. Applications: Good for steel castings and forgings/heat-treatable alloy steels, free machining stainless steel, heat and corrosion-resistant stainless steel/valve stainless steel, aluminum alloy castings, nodular cast iron/chilled cast iron/meehanite iron/ductile iron. Excellent for low carbon/free machining carbon steel, medium to high carbon steel. 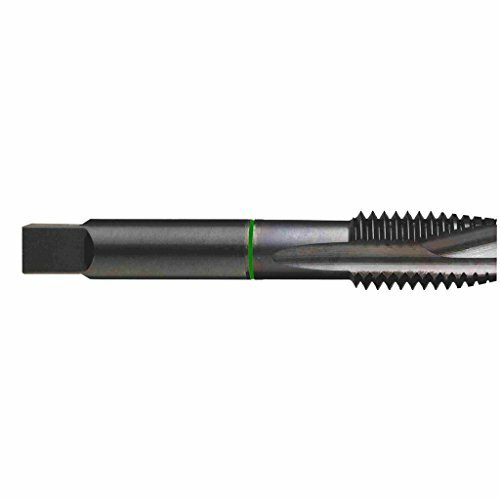 5-40NC H2 2 Flute Spiral Point Plug Tap ~ Ground thread. ~ Ground from solid. ~ High speed steel. Onyx Taps are manufactured to Table 302A standards. For use in general purpose tapping in a wide variety of materials up to 28 Rc Hardness. Steam Oxide over Nitride increases wear resistance, reduces friction, reduces galling and chip welding, improves chip flow and increases tap lubricant retention. Not recommended for non-ferrous materials. Cle-Line spiral point tap: 5/16-18 UNC number of flutes: 2. HSS substrate, bright finish. Plug chamfer for general purpose applications. Spiral point pushes chips forward for through hole applications. Brand: Cle-line | Manufacturer: Greenfield Inc. 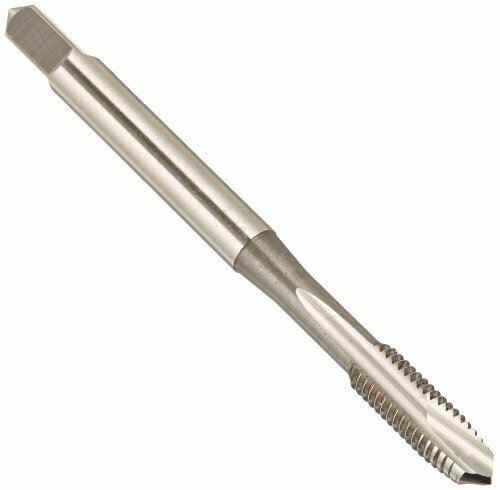 The Union Butterfield 1534NR(UNC)/1534(UNF)/1534(UNS) uncoated, high-speed steel spiral point tap has a non-relieved design, straight flutes, and a round shank with a square end, and is used to create right-hand threads in a range of materials. It is available in three different ANSI thread specification standards: UNC (Unified Coarse), UNF (Unified Fine), or UNS (Unified Special). The spiral point of this tap (sometimes referred to as a gun tap ) pushes chips ahead of the tool and the straight flutes reduce clogging. Both characteristics make it suitable for threading through holes (extending through the workpiece). The non-relieved design of this series has concentric threads without pitch diameter relief. It is recommended for applications requiring close gauging fits and in older equipment that is not sufficiently rigid to accomodate the relieved-style series of spiral pointed taps. Right-hand threads are designed to tighten when the head or nut is rotated clockwise (the most common threading direction). High-speed steel (HSS) is a common general-purpose steel for cutting tools, and is compatible with a variety of materials. With no coating or surface treatment, this uncoated tool can be used on a broad range of materials and provide an economical alternative to coated tools. The round shank with square end helps to minimize rotation in the tool holder. This tool can be used in machines, such as drill presses or lathes, or with hand tools such as tap wrenches. In the Union Butterfield 1534NR tap series all taps have two flutes. The 1534NR(UNC) and 1534(UNF) taps are available with a variety of chamfers. The single 1534(UNS) tap has a plug chamfer. This tap conforms to ANSI standards and can create threads to a depth 2 times its diameter. Both 1534NR(UNC) and 1534NR(UNF) taps are suitable for ANSI 2B and 3B tolerance classes: 2B is an average quality fit for commercial and industrial fasteners; 3B produces close-tolerance fasteners used for greater resistance to stripping, as in aerospace applications. 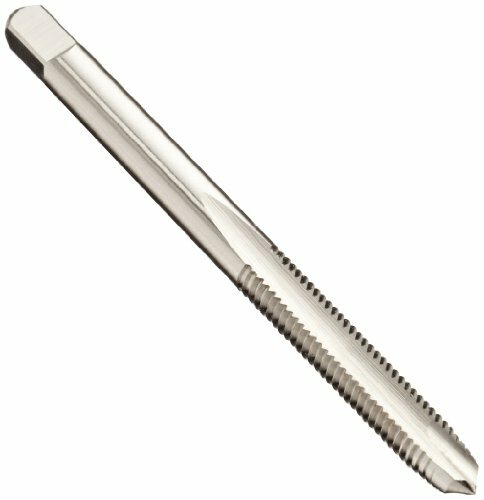 The single 1534NR(UNS) tap is suitable for the ANSI 3B tolerance class.